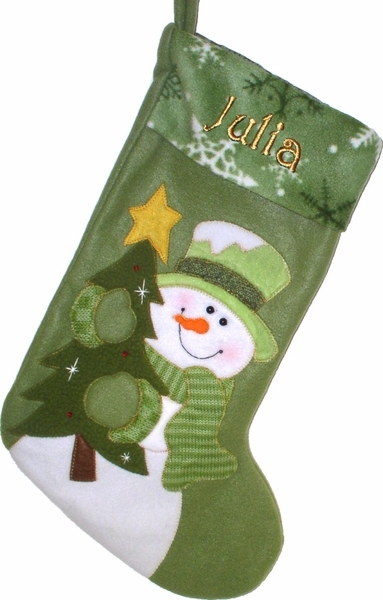 These designer Snowman green Christmas stocking is part of our "Green Collection". The materials on this stocking are just exceptional : the body is green fleece and the applique Snowman is appliqued on in combination of knit, fleece, velveteen and wool materials, fleece and wool applique materials. There are red glass beads on the tree that give this stocking that extra touch of elegance. The cuff is made out of a soft fleece fabric. Measured along the diagonal from the top left hand corner to the toe, the stocking measures 19 inches, and the width of the cuff is 8 inches wide.